James Rose was one of the leaders of the Modern movement in American Landscape architecture, along with his Harvard classmates, Garrett Eckbo and Dan Kiley. Expelled from Harvard in 1937 for refusing to design in the Beaux Arts manner, Rose further developed his aesthetic in the 1940s as a landscape architect in NYC. 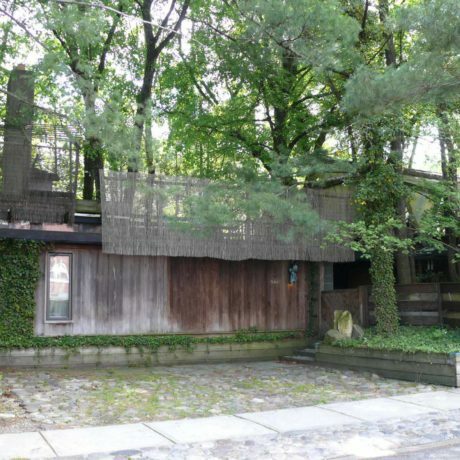 In 1953, he began one of his most significant designs, his own residence in Ridgewood, NJ, now the James Rose Center. Rose’s work anticipated many principles embraced by the design profession today including the concepts of sustainability and the accommodation of evolving use and future growth of a project. Rose’s home became a landmark of Modern design that expresses a fusion of outdoor and indoor space. Constructed of inexpensive and readily available materials such as wood framing and concrete block, it incorporates three separate but interlocking shelters connected by a structural framework and courtyards. In the late 1960s, when Rose became a practicing Buddhist, he added the Zendo or roof garden, which was conceived as a place of meditation. In May 2016, a storm caused a tree to fall onto the roof of the Zendo and the adjacent roof garden structures. The resulting engineering inspection of the damage revealed broader concerns for the structural condition of the entire house. The building comprises interconnected garden pavilions constructed with unconventional methods and light framing. It likely did not conform to the residential building code prior to the damage caused by the fallen tree. Now threatened with subsequent structural and water damage, the building needs further analysis and careful repairs to be safe for its current use and to be in conformance with the relevant building codes. The Rose Center is a 501c3 non-profit educational operating foundation, and there is no insurance money to repair the storm damage. While the foundation has a dwindling endowment and no money for capital improvements, it may be able to commit some resources from the endowment to stabilize the property. The Rose Center is listed on the New Jersey Register of Historic Places, but has not yet been listed on the National Register. If the significance of the house were better established by a National Register listing and a preservation plan, it could facilitate future grants from Bergen County or the New Jersey Historic Trust. Rutgers University Professor Dean Cardasis has written a biography on James Rose that was recently published. This book documents Rose’s importance to the history of landscape design as well as the importance of his home, which should raise the profile of the James Rose Center. The structure of the house needs to be stabilized and protected to allow time for more study. Then, a preservation plan should be prepared to document the conditions and significance of the architecture, structure, and landscape. The plan would provide prioritized recommendations for repair and restoration together with estimates of costs. PNJ hopes that the Center can rebound from the current crisis, and with creative planning and fundraising, can repair and adapt this unique and beautiful structure to support its programs.